Victoria's Gippsland region is the latest flashpoint in the pitched battle to save Australia’s farmland from controversial fracking. Tracey Anton (article) and deputy editor Sandi Keane (video) report. 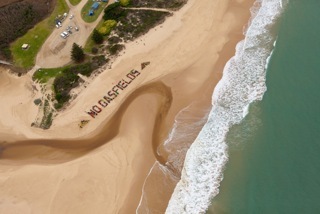 Human sign at Seaspray in Gippsland, protesting against the gasfield development. IGNORING THE PUBLIC seems to be a distinct characteristic of the Napthine Government. This follows his predecessor – former Victorian Premier Ted Baillieu – and his obsession with secrecy. The Nationals certainly can't be considered experts, especially relating to unconventional gas expansion. The result — the biggest potential land grab of all time. 87 per cent of Gippsland is currently under some form of mining licence. The area is on the verge of losing its clean and green image. The Nationals, supposedly the protector and friend of the land, are condoning an expanded mining industry. This expansion is onto our farms, and it threatens not only our investments but our region’s future livability. In approving this unceremonious land grab, the Nationals appear to have sold their soul. They don’t seem to care either. The recent protest at Seaspray and the protestors cry for their community to remain "gasfield free" is a warning not only to the Nationals, but the mining licence holder, Lakes Oil. They should consider themselves on notice. The Nationals and their Liberal coalition partners continually refuse to listen to the local community. The community believes their farming should be of paramount importance. Mining legislation is inadequate and lacks any continuity, doing little to protect the public or the environment. However, according to Member for South Gippsland and Deputy Premier of Victoria Peter Ryan this is untrue. He truly believes Victoria has the strongest environmental laws in Australia. Peter Ryan at his most arrogant. He refuses to listen to his community. He refuses to acknowledge that current legislation has loopholes. Basically, he refuses to offer us any respect whatsoever. We've asked numerous critical questions, all of which he refuses to answer. The Nationals have been warned and they ignore us at their peril. This issue is looming as a major issue in both federal and state elections. The Nationals are firmly in the firing line. Now the election has been called, who should you vote for? Tweedledum or Tweedledee? Who should you trust? As community anger grows, the move to lift the moratorium on fracking has been temporarily shelved until after the federal election, to lower the risk of the Coalition losing their Gippsland seats. In time, it will again rear its ugly head — the war will recommence. 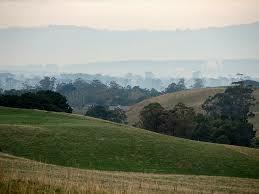 We find it ironic that Gippsland’s rich plains and lush rolling hills once defined the National Party. That connection is no longer apparent. The Coalition’s new connections are with industry power brokers and ex-Liberal Party politicians and Howard-era key advisers. They want to industrialise our land. What the people of Gippsland are fighting to protect. These heavyweights include Dr John White, key Liberal Party adviser from the Howard era and current owner of Ignite Energy Resources. His company holds the massive exploration licence EL4416. It covers over 3,700 sq km of Gippsland. It should also be noted that the world’s richest woman, Gina Rinehart, has taken a large stake in Lakes Oil. It's also worth mentioning that former Australian Foreign Minister Alexander Downer, another Howard stalwart, has been appointed as a member of the Lakes Oil boardroom. Be under no misapprehension about the power of these people over the Coalition. Their pockets are loaded; their influence immense. The Napthine Government is planning to sell off as much prime productive land as it can to their mates. It just happens that we are the unwitting victims who are on top of this valuable resource. All politicians are hiding behind the facade of democracy. Big business is running government at the expense of little people. It will only get worse if Tony Abbott wins the federal election. A vote for Abbott is a vote to cut environmental regulations even more. He would allow industry giants to forever change our landscape and our future. On these issues who do you vote for? 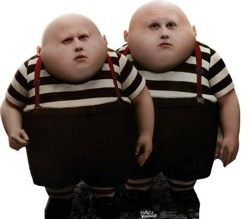 Tweedledum or Tweedledee? Rudd or Abbott? It is quite clear the Nationals are no longer a friend of the land but its foe. Their powerful Liberal connections will bleed our land dry and trump our investments. 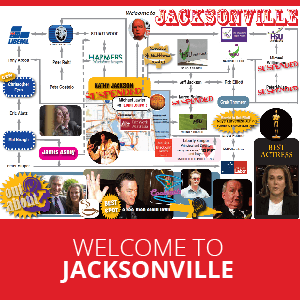 The Nationals under their national leader, Warren Truss, have a mining blueprint policy. The federal Member for Gippsland Darren Chester supports CSG mining. He is of the belief it can happily co-exist with farming. He says this because "he has been to Queensland and seen it for himself". Tony Abbott states that mineral developments need to continue. We can't be any clearer — vote for the Coalition is a vote for the destruction of our farmlands. The Victorian Department of Environment and Primary Industry refuse to publicly release new bio-region assessment reports on subsidence and seismology. So much for transparency? Most importantly, why are the Nationals not moving to protect our food security? Why aren't they prioritising agricultural worth over extractive worth? What is their policy to diversify and transition away from fossil fuels? Here’s a tip for you Darren Chester. It is understood that some of the smartest people in the world are connected to corruption. What are they doing? Buying up heaps of land worldwide. Why? They understand food and water will be the new commodity boom. Surprise, surprise! 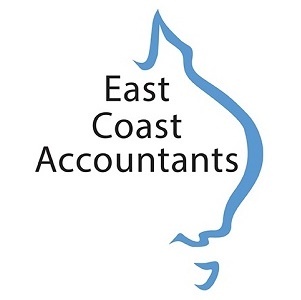 The recent incidents at the Esso Longford gas plant in Peter Ryan’s electorate further highlight that the Napthine Government is more intent on protecting the big boys than the community. WorkSafe Victoria failed to ensure maintenance was up to date at the 50 year old Major Hazards Facility. The Environmental Protection Agency's integrity is seriously in question given their lack of monitoring to ensure public health was protected. All we ask is that Exxon, the parent company of Esso, does the right thing by their workers, their neighbours and the environment. Nobody wants another gas explosion like the one in 1998. Exxon, as joint partners with Ignite Energy in exploration licence EL4416, will most likely be the first company to secure rights to coal seam gas extraction. If they can’t manage and maintain what they already have, how can the public trust them to manage new gas infrastructure in such a poorly regulated system? 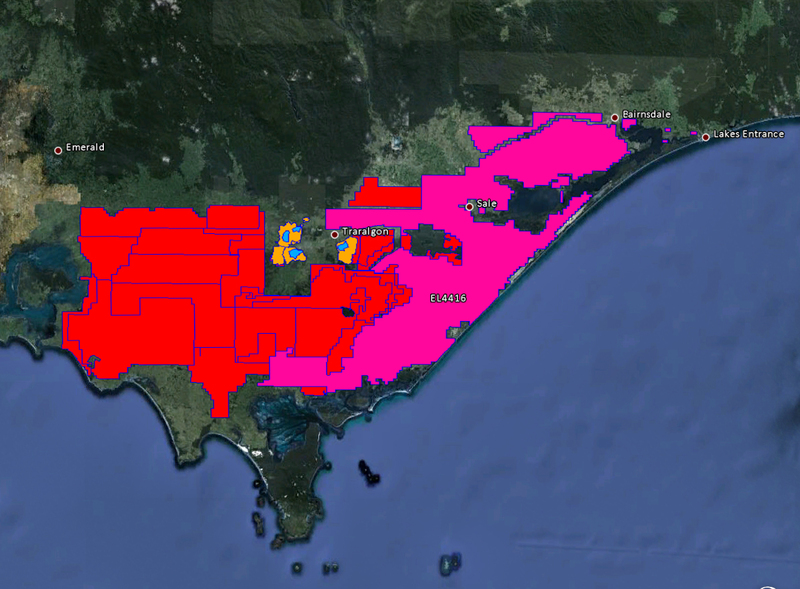 CoalWatch map showing most of Gippsland now under licence and the massive Ignite Energy's EL4416 (click on the image to bring it up full size). We note the glaring hypocrisy of Peter Ryan’s assertions that new power plants are to be cleaner and greener. The Napthine Government has resided over a massive rort in relation to this. The new Esso gas conditioning plant at Longford will emit one million tonnes of CO2 straight into the atmosphere every year with no environmental offsets. None. Premier Napthine and new resources minister Nick Kotsiras said they would be "open and transparent". Here in Gippsland, we are not feeling the love. What we will feel will be the slug from the increase in domestic gas prices due to the export contracts being stitched up with the Gladstone Port. We pay for the Napthine Government’s ineptitude. National members, state and federal, remain silent. Meanwhile, their Coalition partner is in preparation for their mega rich mates to over industrialise Gippsland to supply the export market. Handing foreign corporations huge financial payouts while duping the unsuspecting and trusting public that their government is doing the right thing by them. The Napthine Government is so blind it's dangerous. Where is your strategic master plan? Show us the science. Show us the balanced perspective. The land use priority and improved buffer zones. Show us something that might indicate you have a clue what is going on. We have commenced our campaign. 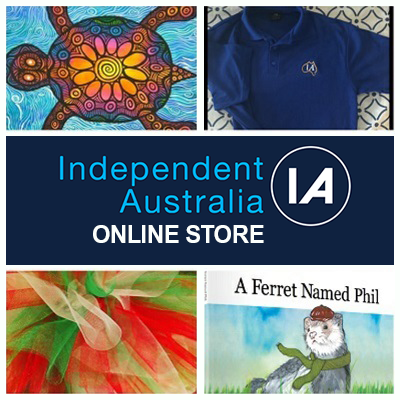 We aim to tell the communities of Victoria the truth. Our reach will be far. Our voice will be loud. We will hold Napthine Government to account. Unlike the Nationals, we will not be silenced. Our message to National and Liberal representatives is simple: Gippsland is not yours to sell off! We don't trust you to do right by us. Gippsland residents are calling on all Australians to rally behind them: through social media and at the ballot box on September 7. Join the Farmers Against Fracking Rally, Sunday 18 August 1pm at Melbourne’s City Square. Hosted by Rod Quantock. Speakers include Drew Hutton. For more information, visit Lock the Gate and Quit Coal. Voting for Turnbull? Here's 5 reasons why you shouldn't! WTF! A secret deal that sees Abbott replace Turnbull in the Lodge?